Runswick Bay is a small fishing village on the North Yorkshire coast, approximately 6 miles north of Whitby. It has a one mile long sandy beach and is very popular with holidaymakers, day trippers and walkers, being situated on the Cleveland Way which runs through the village, along the beach and on across the cliffs towards Sandsend and Whitby. 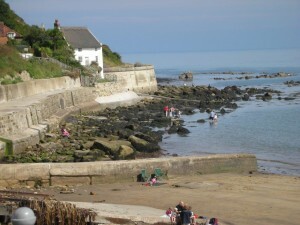 Until the late 1970s, Runswick Bay was the location of an RNLI (Royal National Lifeboat Institute) lifeboat station and the old lifeboathouse is a very distinctive feature of the village. 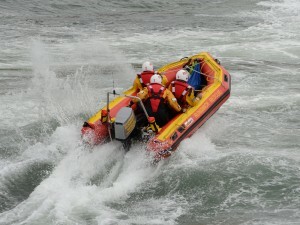 The Runswick Bay Rescue Boat (RBRB) was formed in 1982 after the main RNLI station moved further up the coast to Staithes. RBRB is an inshore facility which works in close cooperation with the RNLI and HM Coastguard with a primary remit to ‘nip in the bud’ incidents that are visible from the village and to access difficult locations along the shoreline where larger boats would struggle. The RBRB Association is an independent registered charity (number 1014544) and is funded from donations, the fundraising efforts of the local community and occasional grants. The crew and committee of RBRB give their time voluntarily.